A fully stocked bar requires plenty of bottled juices, sodas, and alcohols, so keep it all cold and close by with the back bar cooler from Beverage-Air. Available in a variety of sizes, these coolers range from 24" to 94" in width and offer a selection of capacities to best suit your storage needs. The unis are also available in either shallow or deep depths so you can maximize space where you need it. Deep depth coolers come standard with a 2" thick stainless steel top while shallow depth units come standard with a galvanized sub-top. Regardless of size, each unit is available with either heavy duty black or stainless steel finish and with either sliding or hinged doors. Sliding door include a latch for proper closer while hinged doors are field reversible with a 90 degree stay open feature. You can select between solid and glass doors too, keeping product totally concealed or readily visible. Select models even come with a pass through option which is great for showcasing popular brews and for stocking one side while serving from another. All units include locks for security and interior lighting to illuminate product for quick retrieval. 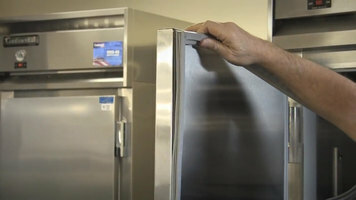 Beverage-Air back bar coolers feature 2 shelves per sections and are approved for packaged product storage, though food graded units are available. Coolers boast a robust, front-breathing compressor that can be located on either the left or right side to best suit your space. It helps maintain safe and consistent interior temperatures. For more unique applications, back bar and direct draw direct combination units, 40-60 degree wine models, and mobile outdoor units are also available. Beverage-Air also offers dual zone back bars that allow you to independently control the temperature of different compartments so that you can serve your beers at their ideal temperature. 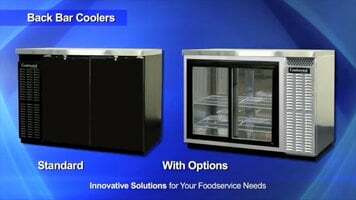 Like all Beverage-Air refrigeration all of these units are proudly made in America. With all the different options Beverage-Air has for their back bar coolers, you are sure to get just the right unit for your space. Check out the different sizes and option available to keep your best beverages cold and ready to serve!